Take your on-road adventures to a whole new level with a 2019 Toyota RAV4 from Gosch Toyota! Our new and used Toyota dealership in Hemet, California enjoys a fully stocked inventory of competitively priced RAV4 models to explore, so don't hesitate to shop our selections online from the comfort of your Menifee, CA home. When you're ready for a more up close and personal look at all the Toyota RAV4 can do for you, contact our Toyota sales department for the driver-centric experience that you deserve! When you are driving around the Moreno Valley, CA area in the new 2019 Toyota RAV4, you will have the option to enjoy three very distinct drive modes that have been tailored to this impressive SUV. First, the Sports Mode provides you with sharper acceleration and control. Then, the ECO Mode helps you maximize your fuel economy. Finally, the Normal Mode blends both fuel economy with the standard RAV4 performance. Experience these features and more when you visit with us at Gosch Toyota. 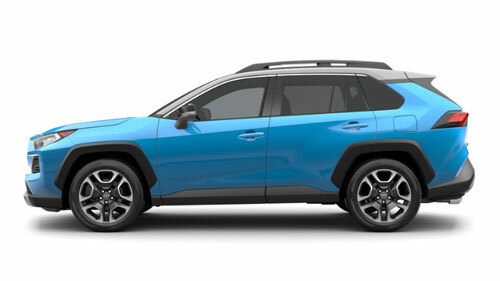 Take the new 2019 RAV4 for a test drive and discover how this notable SUV can revolutionize your daily commute. We at Gosch Toyota understand the importance of driver safety, that’s why it is essential to keep your vehicle maintained and up to date. Visit with our service team at Gosch Toyota to learn how we can preserve the health of your new SUV and keep it on the road longer. Our service team is highly trained and can work with any new or used Toyota sedan, truck or SUV. Visit with us today and see how our team can keep you in your RAV4 longer. Before visiting Gosch Toyota in Hemet, CA near Murrieta, be sure to send our credit professionals a loan application online so that we can start to review all the options that complement your needs, lifestyle and financial background. Our finance team works hard with many different lenders to find the best auto loan options for you. Our knowledgeable Toyota staff is eager to introduce you to an array of driver-friendly priced 2019 Toyota RAV4 models, so don't hesitate to visit us at your earliest convenience or to shop our stylish selections online now directly!